Contact Linda to be added to the mailing list for events in the forest. 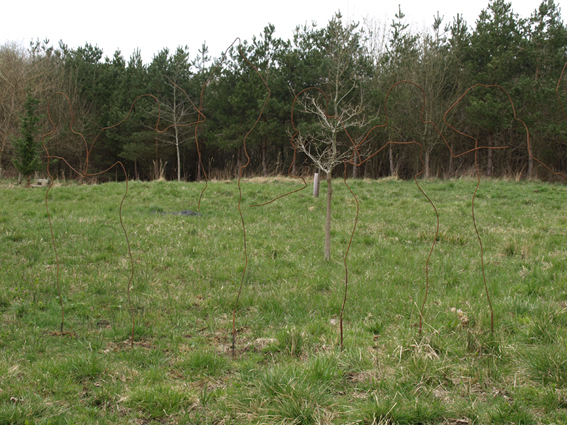 I will arrange walks once the sculptures are resited (expected to be Spring 2015). 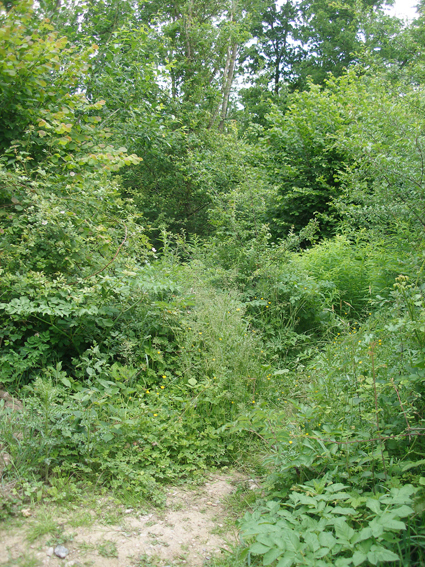 The new sites will probably include some to the west of the current walk to take account of future planned felling work. If you would like details of the walks and other events, please contact me. This sculpture was made from the top of a fallen ash tree trimmed and placed upright to represent the antlers of a forest spirit. 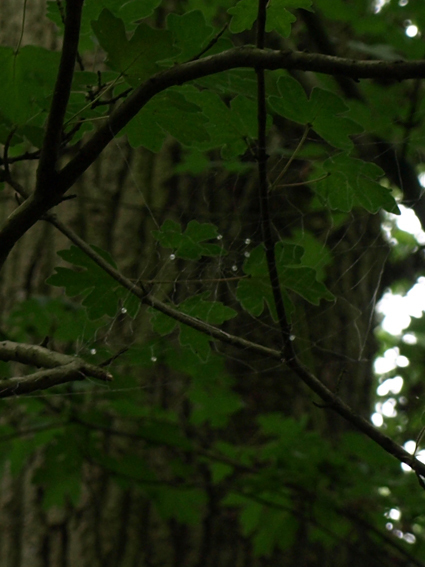 I added a spiders web as an initial 'gift' for the forest and visitors added their own gifts over the years to make this a wishing tree. Sadly this sculpture has now decayed through the natural effects of time and weather and has finally fallen. 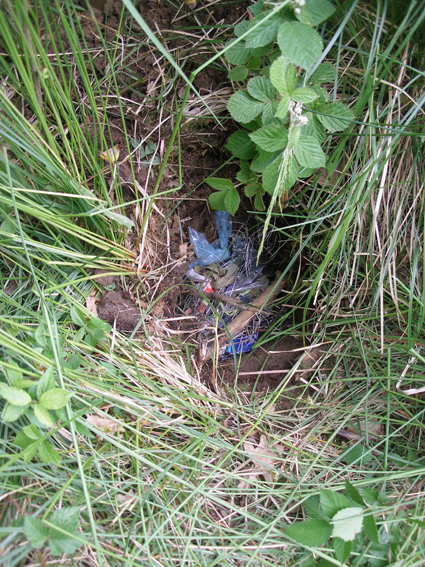 I have carefully removed all gifts and buried them nearby, and have cleared the site to return it to a natural part of the forest. See images of the original sculpture. 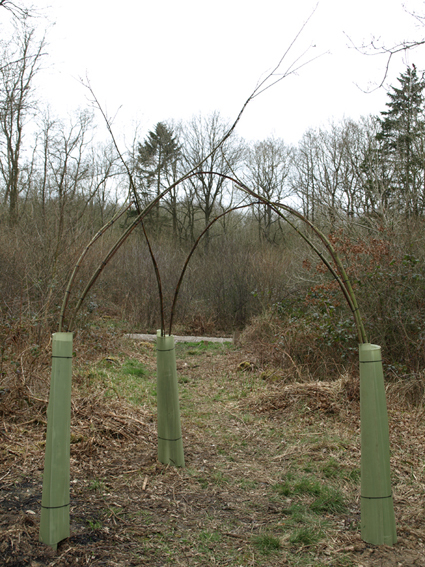 Six willow trees rooted from wood sourced in this area and planted Spring 2013 to grow into three arches. 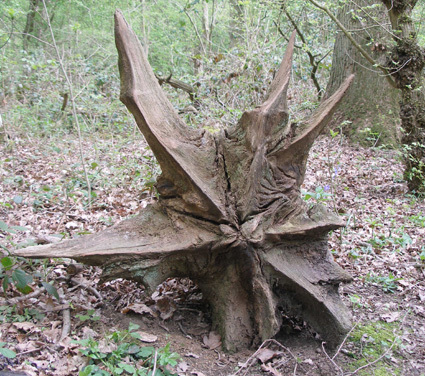 Please note: Regeneration will be left alongside this new sculpture to decay naturally as though it was a fallen tree. 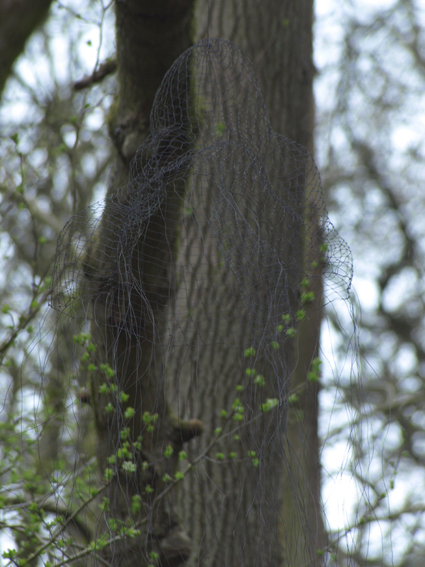 A ghostly figure suspended in this Ash tree. An inhabitant of the wood, 'contemplating' beside a stream. 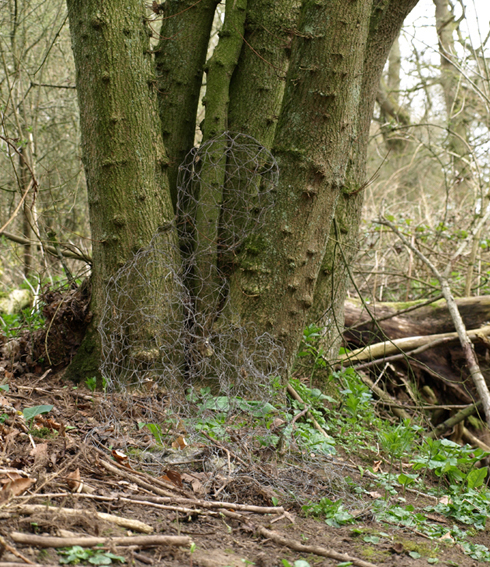 This sculpture is 'in process' - the clay of the original former has now fallen away from the brass wire of the final work and the figure is being gradually absorbed into the forest floor. The 'spirit' of an ash tree emerging from the trunk. 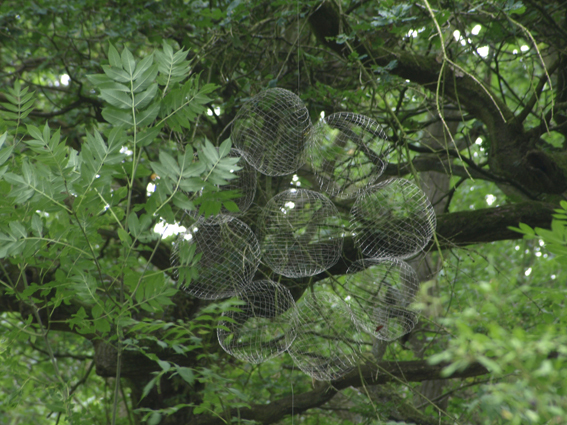 Woven using lines of stainless steel wire to represent the patterns of the bark. 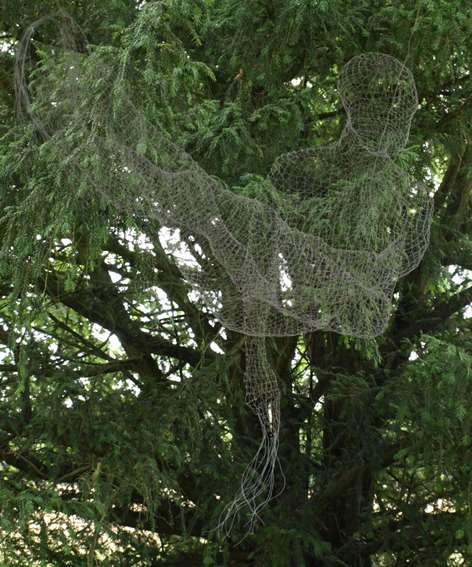 There are now nine figures forming part of an installation sculpture which will eventually create a complete circle. Please note that these figures have been temporarily removed due to damage, however they will be installed in a new location in the Spring. Nine spheres joined in a single disc which spins gently in the breeze to suggest the phases of the moon. 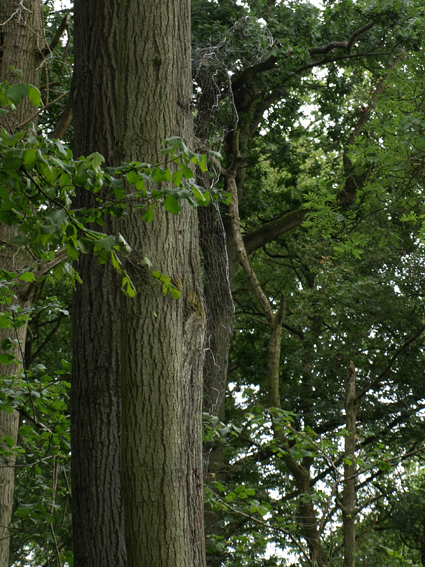 This sculpture returns to the forest in a new site - hanging from an Oak tree near the previous site of Body weave II (please note this image was not taken in Salcey forest - I'll be replacing it with a new image soon).